I had many teachers during my 16-year, on again, off again journey through the world of academia. Some were acceptable, some were not, and some really helped define who I am as a person. One in particular holds a special place in my memory, but for a very unorthodox reason. If you’ve read any of my previous blog posts, or have an understanding of my relationship to Kids Discover, you’ll know that I am a full-time freelance illustrator; who also happens to enjoy dishing out the occasional written word. I am first and foremost an artist though, and make no bones about drawing in and on most everything that happens across my desk. Whether that be a bill from the electric company, my calendar, contracts (yes), or even a sheet of actual drawing paper (how urbane! ), nothing is safe from my scratchings. This “talent” has been with me since my inception, and began to find some interference when I entered the public (and the parochial) school system. For the most part I was asked to refrain from my hobby until school was out each day, but as any good illustrator knows, that can be a challenge. Most teachers were polite enough to attempt to focus me during study time, but one in particular had the good sense to step back for a moment, assess the situation, and put my talent to work. Talk about being in 7th Heaven! Heck, I was probably in 8th, 9th, or 10th Heaven. I immediately dove into the exam, my mind absolutely racing through matters of all things geographic. And yes, there was enough time left to create a visual explaining why penguins are only found at the South Pole. This method soon became standard fare for me, and eventually for some of my other artistically-inclined compatriots as well. And for the record, I did quite well on the test as I recall. It wasn’t until a few years later that I realized I had been duped. My teacher had tricked me into learning things! My grades had gone up, my retention and comprehension improved markedly, and my passion for drawing was seeing no decline either. So, aside from the underhanded aspects of teaching that my mentor had so subtly employed upon my personal self, how does this affect what you do in the classroom? There are many schools of thought now on how best to approach a particular student to engage him or her in the process of learning, whether through visual aids, in-class activities, or simple enthusiasm. I wish to proffer the following: Let them doodle. The typical doodler is a person in a business situation who is passing time while talking on the phone. But are they just passing time? Applied Cognitive Psychology recently released a study involving 40 people who were asked to monitor a monotonous telephone message. Of the 20 persons who were asked to doodle during the situation, the retention rate was 29% higher than those who did not doodle. The science here says to us that–though doodling may appear to be a thoughtless, random act–it actually uses enough cognitive energy to focus our brain, preventing us from daydreaming. If you will, it keeps us in the moment. Sunni Brown is the author of Gamestorming, a book on how the use of arts and games can empower some serious problem-solving. She is also featured on a Ted Talk video where she details the history of doodling, and brings it around to what it actually is: A way to improve our (and your student’s) comprehension and creative thinking. 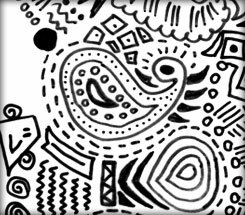 So how can you put doodling to work in your classroom? First of all, think of it as a tool rather than as a punishable offense. Begin by designating one exam per week as doodle-worthy, with the same plea as my teacher used; “Do the best you can, then…” Consider having students doodle while you’re reading to them, or during a short lecture. Think about having students doodle on their own notes. You might even sponsor a “best doodler” contest each week, asking your students to vote on the winner.